My son is a admitted chocoholic. He loves all things chocolate. His favorite candy is Hershey’s Cookies and Cream Candy Bar. It really was no surprise that when he saw a cookie mix for cookies and cream cookies he picked it up and said I needed to buy it and make the cookies for him. A compromise was made and he agreed to letting me make the cookies from scratch. Oh geez what had I gotten my self into this time? I bought the chocolate cream filled cookies and finished the rest of my shopping and headed home to make cookies. 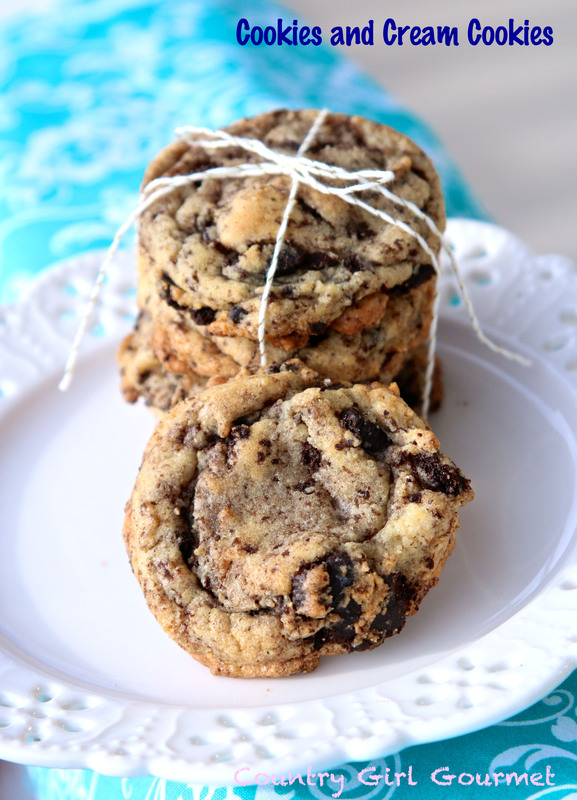 *optional* Add 1-2 cups of your favorite chocolate chips. My husband feels this may be too much but my son thinks that they will make these cookies even better. I leave the to add chips or not to up to you. 2. In a large bowl cream together butter, shortening, brown sugar and sugar until light and fluffy. 4. Gradually mix in Flour, Baking Soda and Salt. 5. Add in crushed/broken chocolate sandwich cookies and mix well, evenly distributing cookie crumbs. 6. Chill cookie dough, overnight to 24 hours for best results. If you are in a rush for cookies 2-4 hours will work. 7. Use a cookie scoop or spoon and drop onto a parchment lined cookie sheet. *All butter or all shortening may be used instead of half and half. Margarine may be used in place of butter. The end result will change the texture of your cookie.